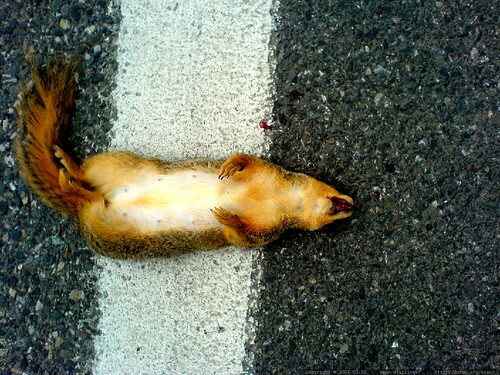 noromdiam: Oh man, poor squirrel. Paul D Blake: That is a fantastic photograph. why do I find it so compelling? Macabre and comic. Bravo! hollibobolli: The black plague got him. Mother F'er. And just for the record - I brake for SQUIRRELS!!! Dammit - I just spent the night getting all happy and stuff on cuteoverload.com. I'm RUINED! sean dreilinger: hahah vikinghill. no squirrels were manipulated in the making of this cell-cam snapshot. HeideKlein_OrangenKopf: Hi, I'm an admin for a group called Roadkill_, and we'd love to have this added to the group! ricko: Hi, I'm an admin for a group called Fresh Corpses [Perfumed], and we'd love to have this added to the group! phonecam [81 photos] lower-resolution images from an awkward, uncontrollable cell phone camera.